The material below assumes that you are familiar with the process for generating Word documents using Apsona's Document Generator. Apsona's Word document generator lets you include images and graphics directly in your Word template, and those images will appear as positioned in the output Word document. These are examples of static images, in the sense that the images are wired into the template so that the same images appear in all the documents produced by the generator. But there are many situations where you would want to generate a Word document containing images produced dynamically, e.g., from a web URL. For example, when conducting an event that will host a number of attendees, you might need to generate a sign-up sheet for the event, containing the name, phone, email address and a QR code for each attendee. Whilst the name and email address are text fields, the QR code is a dynamically-generated image that encodes the information you specify. A similar example involves including, for each attendee, a profile picture that is available at a URL for that attendee. 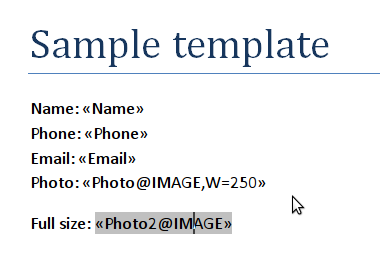 In your document template, there must be a merge field that can be mapped to the image's URL. The URL data must be available for merging, either from a field in one of your objects, or from a calculated value produced in the Apsona report that feeds the merge. Note that the formula relies on the Contact ID field in the report. Also note the parameter chs=150x150 which specifies the size of the generated QR code in pixels. If you want to change it to, say, 100x100, you would instead use chs=100x100. There are two alternative ways to create a merge field for an image. The first is the preferred way, and the second - the one that uses INCLUDEPICTURE - is the older technique that is retained for backward compatibility. mergeFieldName@IMAGE,W=nnn specifying a field named mergeFieldName whose contents will be replaced by the image at the corresponding URL, with the produced image spanning nnn pixels in width. If you leave out the width specification, the image shown in the document will be the same size as the original image at the URL from which it is fetched. But if you provide a width, the height of the produced image will be correspondingly scaled to preserve the original aspect ratio of the image. If there is a problem with retrieving the image, e.g., the image is not found on the server, Apsona will show an error message in the generated document in place of the image, indicating the nature of the problem. This is the older technique for creating merge fields, and in some ways is less reliable because Word sometimes refuses to update the generated document correctly. In general, we suggest the use of Method 1 above for most use cases. Create a merge field, as usual. The process is much easier to understand by watching this demo . A key advantage of Method 1 above is that the images are included as part of the generated document, with no additional steps needed on your part. You can also generate PDF documents using the technique of Method 1. But method 2 (the older INCLUDEPICTURE method) has some disadvantages in this regard. Once you have generated the merged document and downloaded it, you will need to tell Word to update all the images in the document before it can be printed. You can do this by pressing Ctrl-A (select all), followed by F9 (update all fields). You will then see a ready-to-print document, part of which might look like the screen shot below. If you like, you can download the .docx template that produced this screen shot. This mechanism for dynamic images is only available with Microsoft Word. It is not available with either LibreOffice or Google Docs. PDF generation with dynamic images is supported only with documents that use Method 1 above. Including dynamic images in emailed documents is supported only with Method 1 above.